We're being overrun by wild animals at the Meehan homestead - just not the usual ones. There are, for example, no bears. We keep our bird feeders filled, place our vegetable scraps in the compost, even provide nighttime outdoor lighting so the ursine creatures can see clearly, and sit poised in the family room with our digital camera at the ready - but still nothing. Maybe we have to move to one of the tonier suburbs, or improve our computer-aided photo enhancing skills in order to get onto the five o'clock local news. There are rabbits, but unlike prior years they seem utterly oblivious to our vegetable garden and its rows of lettuce and burgundy beans. In previous times we've had as many as three of these long eared conies indulging their appetites on our tasty green offerings. They exhibited a special fondness for the green leaves of the latent legumes, memorably on one occasion leisurely sitting and munching on them while Marsha stood within reaching distance and verbally hurled horticultural obscenities into their aurally acute ears. They also were undeterred by our old standby "mucho caliente" Tabasco sauce and water spray. But now, even though there are two of them, neither one seems interested at all in what is growing inside our small backyard plot. There are however three even more mysterious and, in some cases actually nefarious, outdoor houseguests that are making news at our humble abode. First is what we believe to be the only single, i.e. partner less, pigeon in the entire world. We noticed him early this spring when we were doing an informal count of the Rock Dove descendents in our yard and came up with an odd number. It was too early for this season's offspring to be around, and all of the birds that we could see looked to be adults - so we began to pay closer attention to these bird visitors from the city and noticed that at the end of the day, when all the others had left in pairs, one solitary male remained. And he's still here - from first thing in the morning 'til closing time, day in and day out, rain or shine. Other than the fact that we'd prefer not to have any pigeons at all (although it's pretty low on the list pigeon avoidance still is one of the main reasons that folks move from the 'urbs to the 'burbs) Walter, as he has come to be called, is pretty close to the perfect yard guest - quiet, polite...and clearly very lonely. Unlike our second live-in - the plastic eating squirrel. 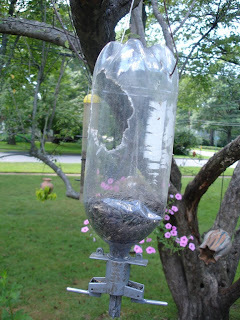 Because the tree rats used to destroy them we use a bird feeder made out of old soda bottles with a screw-on perch. For the past couple of years however the bushy tailed rodents that occupied our oak trees have mellowed to the point that it actually seemed possible to replace this slightly tacky looking device with a nicer, more upscale model. And then, a couple of weeks ago lying in bed we heard a noise that we couldn't place - kind of like finger nails rapidly scratching on wood. During breakfast in our feeder-view family room Mars suddenly jumped up and ran out the door shouting "You! Squirrel! Stop that right now!" and I looked up to see a totally nonplussed bushy-tailed rodent trying to pretend that he wasn't leaning over a newly constructed jagged hatchway into the seeds. As Mars proceeded the tree rat receded. But he quickly returned when she came back inside. And she and he have continued this little tango intermittently over the past week of so. I sprayed the bottle with the aforementioned Mexican mace apparently with no success based upon what we heard from bed this morning from bed and what we saw when we checked out the feeder minutes later. I'll continue to spray because, "why not?" - but I doubt it will have any effect. I suspect that we would be better off, as non-soda drinkers, just hitting up our friends and relatives for their discarded containers, or stocking up on duct tape to either cover up the holes in the bottle or, better yet, to wrap around the mandible of the little polymer puncturing pest. The third member of the crew is invisible - at least so far - except for what he/she leaves behind. What we have come to call the "veiled, vomiting varmint" has been besmirching two of our perennial beds pretty much every day now for the past several weeks - never once leaving any clue other than its little (or big) contribution to our mulch. You can hardly swing a dead cat in this neighborhood without hitting, well, a live one - so we assume that it's one of them, but we have no proof. And short of spraying some generalized animal repellant just about everywhere, everyday, there doesn't seem to be much of a solution. That is unless one of those Avon or Simsbury folks has an extra bear that might be available for a few days - one that's looking for a little variety in its diet and a lot more challenge in its food gathering. I'm sure we could work out some kind of equitable deal - I mean there's got to be plenty of people out there who've never, ever seen a real live pigeon up close - let alone Walter, the world's only bachelor one. Update: Since the original penning of this treatise a couple of new things have come to light. But, as a former boss of mine used to say, "Why spoil a good story with the facts?" So the above dissertation remains as is. But here is the latest info. 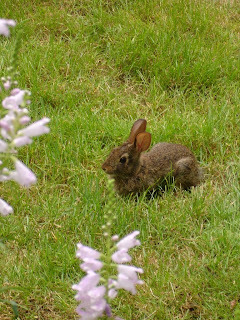 The rabbits apparently were not satisfied with the nutritious grass and clover in our yard and wandered into the garden - one day I saw them scurrying into the adjacent iris bed, two days later the entire bean crop had been decimated. And the weird varmint vomit turns out to be something called yellow slime mold (AKA dog vomit fungus) - an unharmful albeit unattractive organism that appears in moist, warm areas such as mulch. The plastic-eating-tree-rat and Walter the bachelor pigeon are still with us. We are currently looking for a good recipe that uses two rabbits, one squirrel, and several bean leaves & stems. 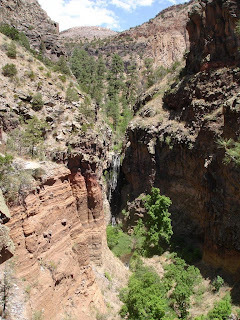 Of the four hikes that we took on this New Mexico trip (Tent Rocks, Tsankawi, Valles Caldera, and the Falls Trail at Bandelier National Monument), the latter is by far the most difficult walk. And, as its name indicates, one of its major attractions is the falling waters. The complete trek is about a five mile out-and-back (as opposed to a loop) from the visitor parking lot to the banks of the Rio Grande but, as with any such trail, the turnaround point can be anywhere along the route. This one provides at least three logical places to turn back: the end of the trail head (about one half mile), the Upper Falls (one and one half miles beyond and three hundred fifty feet below the trail head - three times that distance on the way back up), and the Lower Falls (approximately one quarter mile further still) - so depending upon time constraints, energy levels, or whatever, you can feel satisfied without overextending yourself. Mars and I have hiked this trail numerous times by ourselves, every time but once out to the river. 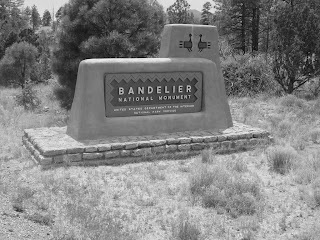 Last year we brought Sandy to New Mexico and Bandelier for the first time and walked to the end of the trail head having spent the morning walking on Bandelier's shorter, more accessible Ruins Trail. Energy levels and a time constraint caused by construction on the road into/out of the park that shut it down in mid afternoon dictated our plans that day. 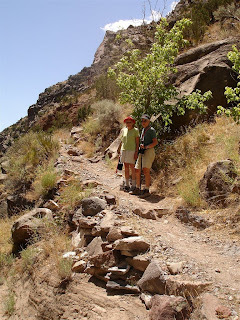 Besides, seeing a waterfall in the high desert should be enough of a breathtaking experience for one hike - especially on this drought-filled trip. While we were out there the Santa Fe newspaper reported that the year-to-date rainfall had gone up from 1.44 to 1.46 inches. By contrast, at home in Connecticut during those same two weeks we acquired about four and one half inches of additional precipitation according to our own front yard rain gauge. Because of the amount of personal hydration that is required in the high desert just to maintain normal equilibrium - never mind hiking and such - ninety-nine plus percent of the water that we had seen in New Mexico was in plastic containers or ice-filled glasses. So, armed with our bottles of water the three of us set out onto the Falls Trail, our hydration goal being to gradually deplete our h2o supply, emptying it completely on our last steps off of the trail. The source of the water on the Falls Trail is the El Rito de los Frijoles ("Little River of the Beans") which, like the feet of the Anasazi at Tsankawi and the desert winds in Cochiti, has made its own mark on the Tuff Rock canyon walls of Bandelier. (As at Tsankawi and Tent Rocks, this stone is also a byproduct of the Valles Caldera volcano). 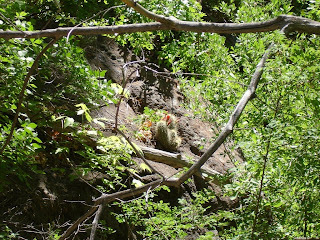 The trail begins with a moderate up-and-downhill walk along the top edge of the Frijoles Canyon - another pine and oak tree dominated scene that could be in New England except for the white New Mexican rocks visible on the other side of the chasm. You can hear the river before you see it. Still having been conditioned by the relentless dryness it just doesn't sink in that the background noise is actually rapidly moving water. Even though I know to listen for it I still mistake its sound for that of an overhead airplane which, when it turns out not to be there, redirects my attention to the base of the canyon and the barely visible river. The falls are even more startling. The first time that Mars and I took this Trail I, as frequently happens, was totally unaware that there was an actual waterfall to be found. When Mars pointed it out to me ("Why do you think they call it the Falls Trail?") I set my mind to expect something maybe a little larger than a homemade water accent in a backyard goldfish garden. Well, it isn't Niagara but certainly it is worthy of being the center point of a Hudson River style landscape. Like the river that is its source you hear the falls before you see them - if you listen carefully. And even if you've heard them, turning the corner on the descent into Frijoles Canyon and suddenly seeing the falls is startling. Mars and I had expressed amazement the first and every subsequent time that we've seen them and Sandy who on her one previous trip to New Mexico had expressed "Oh my!" and "Isn't that beautiful!" several times a day was moved to say the same at the suddenly appearing cascade. After all, this is a waterfall in the depths of the desert! This particular cataract is a sixty feet high, thick, continuous braid of fast moving water framed rectangularly by gray basalt rock that was also deposited in the canyon by the ancient volcano. And since in the New Mexico desert trees follow the water, green vegetation returns at the base of the falls where the water levels out for its further journey along the hiking trail and out into the Rio Grande. After a respectful pause we continued on down the trail to its lowest point, sat in the shade and ate the sandwiches which we had made up for us at a grocery store in White Rock. Then, after Mars and I checked that our water bottles were half gone, we headed back up the switch backing trail. My earlier comment about the length of the trip back was understated by at least a factor of three. The sun had brightened, the air temperature had increased, and gravity had inexplicably gotten stronger. We found ourselves stopping at nearly every spot of shade for a quick breath of air and sip of water. As a result our last view of the falls was somewhat diminished by our inability to lose ourselves in its rapture while we were consciously forcing whatever oxygen we could find into our quivering lungs. And then we were back. Mars and I drained our water bottles as we stepped off of the trail. Sandy, who didn't quite buy into our hydration campaign, still had about one third of her liquid left. A waterfall in the desert is such a magnificent anomaly that, if you do ever take this trek, be sure to soak in as much of it as you can on the way down into the canyon. Even the most magical miracle of nature can quickly lose its luster when it is drowned out by the gasps and groans of an air-starved observer. Compared to Tent Rocks and the Tsankawi Cave Dwellings the Valles Caldera National Preserve is nothing. Not just less. It's nothing. Nada. Nil. spewed its inner self over much of the southwest and forming, among other things, the aforementioned preternaturally ominous Tent Rocks' hoodoos and the soft tuff on which the Tsankawi Anasazi permanently blazed the trails to their carved out cave homes. Then, after it had given all of itself, the vented mountain collapsed inwards like a black hole into the prehistory of the Jemez Mountains. It looked like nothing - or at least nothing that we could see -when Mars, Sandy and I drove up to the Caldera Preserve with Monica and Bram after having rendezvoused with them at the new White Rock Visitor Center. The trip there took us through the residue of the Cerro Grande Fire of 2000, a horrific natural disaster described in neutered bureaucratese by the National Park Service web site (emphasis added): "The Cerro Grande Fire began as a prescribed fire in the Upper Frijoles Units 1 & 5 of Bandelier National Monument. It escaped prescription on May 5, 2000 and became known as the Cerro Grande Fire due to the fire being on Cerro Grande mountain, a prominent geographic feature of the area." Mars and I drove through parts of this area in May of 2000 and saw the omnipresent water-dumping aircraft. But the thing that I most remember is a fragile appearing pile of cinders in the shape of a denuded pine tree looking as if it would crumble into a pile of unrecognizable ashes, were it touched even ever so lightly. Although some growth has taken place in the area, most of the fire damage remains and will for a long, long time - as such things go in nature. We parked in a roadside area with, as far as I could see, no indication of its relationship to the caldera. Then we crossed the road and began walking onto a well-marked dirt trail surrounded by what could be easily taken to be a basic New England forest, except for the genus of pine trees. There even were pockets of irises and (of all things) dandelions blossoming along the side of the path. The trail was about one mile long and ninety percent downhill with ten or so switch backs. And pretty much all there was to see was the surprisingly varied ground fauna, the thick towering pines, and the sky visible between the arching tops of the trees. A pleasant enough walk on a nice day but, at that point, nothing more. Then I accidentally looked to my right through a slight clearing in the forest and caught a glimpse of vastness. I quickly turned away realizing that I had already unwittingly taken some of the edge off my upcoming introduction to the caldera. About five minutes later we walked out of the woods. In geographic terms what we saw was an area of dark grass dotted with some large rocks and a few coniferous trees that flowed into an apparently empty field of pale brown grass with mountains in the distance. Psychologically it felt like I was looking at nothing - or more accurately looking INTO nothing, as if the largely barren area into which I was now staring (actually probably more like gawking) was the physical embodiment of the absence of everything. We Easterners are used to boundaries. We feel comfortable within them and probably actually like them. Suburbanites proudly mark our property limits with privet hedges and stockade fences, and skillfully maneuver lawn mowers along the edge of the invisible portions of these dividing lines so as to not impinge on our neighbor's turf. Trees and housetops delimit the picture frame within which the sky presents itself each evening. And distances around here are very, very finite. We placed the food that we had brought in with us among the rocks and wandered out into the caldera proper - down to the barbed wire fence that, in its role as a barrier to further entry into the grass covered crater, momentarily restored my East Coast-centric view of the world. Until I looked to the left and to the right and saw, equally in both directions, not the slightest hint of the end of the fence, nor where presumably it turned to form a right angle with its lengthwise sections. Over years of visits to New Mexico and West Texas Mars and I have been exposed to various examples of the vastness of the Southwest: the thunder storm "off in the distance" that you can never ever get to, the stereotypical highway centerline that disappears from the top of the photo, and the miles of barren high desert encircled by layer upon layer of frail, shadow-thin mountains. But like the altitude, every time you think that you've adjusted to it and try something new you find yourself gasping in awe at the overwhelming effect such basics as a shortage of oxygen or a lack of manmade boundaries can have. Which of course is one reason that we keep coming back - to escape prescription. The terrible news is that David (dah-veed) Penguini has been taken. The bad news is that neither Marg nor Jorja from tv's CSI came to investigate. The good news is that Officer Newton, who did come, has prior experience in tracking down kidnapped penguin yard ornaments. After about twenty years of guarding our front door, David is gone. Mars stepped out to get the morning paper and immediately noticed his absence. I called the local police shortly thereafter. "I'm calling to report a stolen yard decoration." "Can you describe it please?" "It's a plastic penguin about three feet tall. Filled with sand. It's just like the penguins that are kept outside the offices of the local oil company." "Okay Mr. M..... We'll send someone out." About one half hour later there was a knock on our door. I was otherwise occupied, so Mars answered. The one male voice that I heard quickly disabused me of any hope for at least one low-cut-bloused female forensic investigator. Mars and he were staring at the outline of David's base on our gray stone front step. Officer Newton said "I know. After all that time he was family." We found David around two decades ago at one of the funky stores in Northhampton Massachusetts. He was one among many. We purchased him, brought him across state lines to our home in Wethersfield, filled him with sand (he being a hollow plastic shell) and placed him on our front step adjacent to the door knob. And he has stayed there faithfully all these years - buried in snow, frozen in ice, poured on by rain, and baked by the sun - guarding that entrance, except for the brief period of time when our front steps were being replaced and he stood nearby waiting to return to his rightful place. So we were left repeating to Officer Newton the same words that I had told the dispatcher who took our original call. "It's about a three feet tall plastic penguin. Filled with sand. He's just like those penguins on the lawn in front of the oil company." "I've had prior experience returning those penguins to their home." said Officer Newton. But that was pretty much the only assurance that he gave us. After he left we took a ride to check out the oil company penguin display. It was in disarray with several birds scattered beak down on the ground and possibly a few missing. Is there a cell of the P.L.O. (Penguin Liberation Organization) operating in town? Did Officer Newton put out an A.P.B.? And would Marg and Jorja do a better job of keeping us abreast of the investigation?